If you long for Nordic hospitality and breathtaking fjords then Norway is the place for you. If you’re relocating or just want to take a Viking vacation and wish to take your car to Norway then you’ll want to plan ahead a bit. Before you make a commitment to your car delivery to Norway there are a few preparations to make which will help you complete the transportation with ease. Check the condition: If you are importing a car to Norway from an eBay auction then you will need to contact the seller regarding the car’s starting condition. Otherwise you should take it upon yourself to note down the state of your vehicle – this will help you notice any damage that might be caused during its transportation. Firing on all cylinders: If you intend to transport an older model or antique car, then you might want to be sure that it’s roadworthy before shipping it. You should have an MOT anyway if you’re intending to use your car over there. As it’s outside the EU, importing a car to Norway is subject to slightly different rules. Temporary import of a vehicle to Norway can be done duty free, although the move must meet certain criteria. Residents outside Norway or those staying for a designated and limited period of time may import cars for up to one year (sometimes permanent residents may also import cars). If you’ve stayed in Norway or been registered as a citizen for more than 365 days in the 2 years prior to the vehicle’s importation then you can’t be deemed as a non-resident. Any usage of vehicles breaching these regulations will result in the owner paying VAT and MTV (motor vehicle tax). Bear in mind that you can’t (without the consent of the transportation authority) use a temporarily imported vehicle for commercial purposes. - Make sure that the car has the necessary insurance and licence plates to be used in Norway. For the full official regulations on importing a car to Norway permanently or temporarily please visit www.toll.no (make sure to click English in the top right!). If you don’t fancy the idea of driving your car across Europe or taking the ferry, or if you’re simply importing a car and can’t be there to drive it yourself, there are a number of options open to you. Single Trailer: If you need a bespoke car transport to Norway service, or need to move a vehicle that is currently un-roadworthy then your best option might be a dedicated flatbed or towing transport. 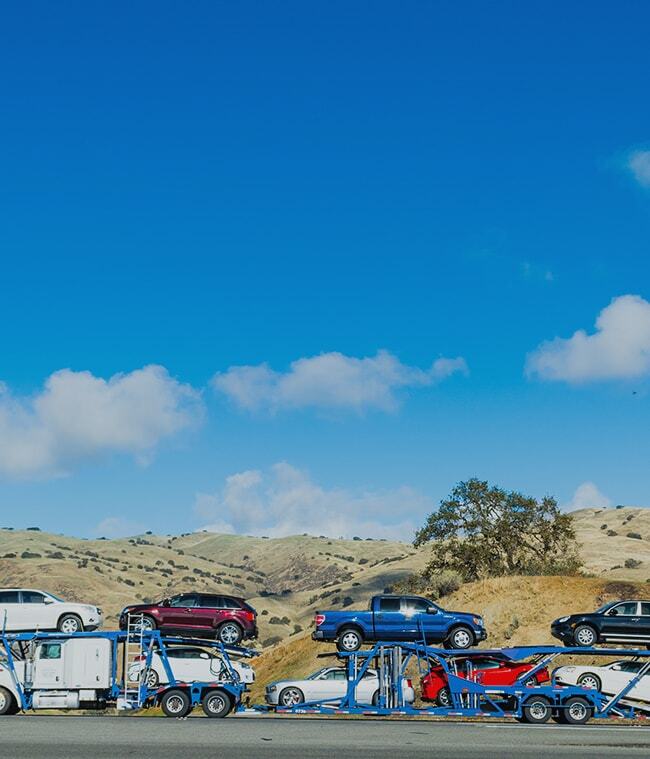 The benefit of this type of company is that it generally offers the most flexible type of service, this flexibility comes at a cost however – single transporters are among the most expensive ways to ship an auto. Multi car trailers: Much like manufacturers transporting cars to their showrooms many exporters do use large lorry-like transporters to move many vehicles at once. This mode of car delivery to Norway can save you money as your car shares the journey with others. The caveat to this type of shipping is that, due to their size, large transporters generally cannot deliver or pick up locally, meaning an extra journey for pick up. Driven service: Instead of making the trip to Norway yourself you could always hire a trade plate driver to deliver it for you. These individuals make their living by delivering cars all over the place, and if they have a reason to be in Norway then you could find a very good deal. The temporary nature of trade plates means that you don’t have to worry about road tax. Shipping options: Norway has a large coastline (over 100,000km if we’re counting islands and fjords) meaning that it has a number of docks for imports. Oslo, Sandnes and Haugesund are all large ports towards the south of Norway. If your car is not being driven on and off the ferry you can opt for a shipping container, which is more expensive but almost guarantees safe passage of your vehicle. Whichever mode you choose, do make sure to check with the Norwegian import authority beforehand, your car transport company will also be able to help you with this. If you’re in the market for a car transport to Norway company then the number of choices can be daunting – there are plenty of firms to choose from, and if you want to get the best deal then you could be spending a lot of time requesting quotes. Listing your car delivery to Norway request on Shiply will bring the transport quotes to you. Available transporters will be able to quote on your car move, and you can compare them on their price, feedback score and received reviews. Simply accept your preferred quote and get your car moving. When you get to Norway you’ll need to report to the customs officers to declare your import, if you don’t already have a transit document they should provide you with one and point you in the direction of a customs and excise office. You should purchase temporary number plates from the Norwegian Road administration offices – when you clear customs you need to hand over your foreign plates. You also need to pay VAT and carbon taxes to “clear” customs – these are related to your car’s emissions. Next you must register your vehicle with the Public Road Administration, who will also provide you with details of how to pay your annual vehicle tax. Once you’ve paid your taxes and your car is registered you have successfully imported a car to Norway, gratulerer! We’d love it if you would leave feedback for the transport provider you found on Shiply – our feedback system is valuable in helping all of our users find the best services.